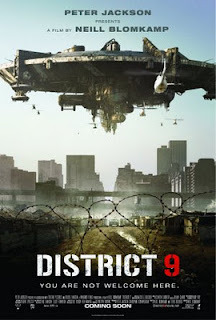 District 9 is the first feature from South African Director Neil Blomkamp and is produced by Peter "Lord of the Rings" Jackson. Breaking the format of traditional summer blockbusters, District 9 starts with a mockumentary style opening. A collage of news clips and hand held camera footage neatly informs the audience of the back story and sets up the rest of the film. In the not to distant future, a space craft has entered Earth's atmosphere and has settled above Johannesburg, South Africa. Hovering menacingly but seemingly inactive, the military eventually break into the ship. There they find an entire population of aliens huddled together in unsanitary conditions, starving to death. The aliens are relocated to the ground and governed by a private corporation called Multi-National United. The lobster / grasshopper looking aliens (nicknamed prawns) are despised by humans, who demand they are moved further away from town. A task entrusted to the films protagonist and MNU employee Wikus van der Merwe (Sharlto Copley). 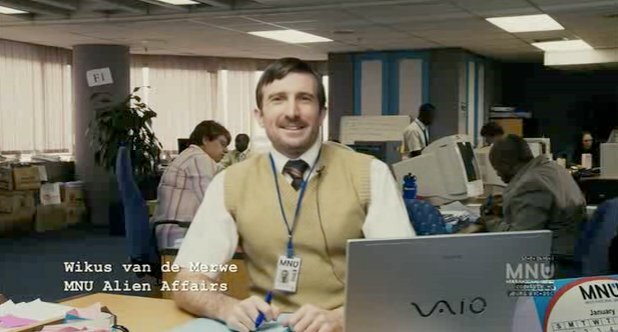 A camera crew joins Wikus as he cheerfully (annoyingly cheerful) rounds up the aliens and begins relocating them from District 9 to District 10. It's in these scenes that the films political message is most effective, paralleling the racial segregation enforced in South Africa from the early 50's to mid 90's. The posters that can be seen throughout the film (and skilfully used to market it), are a hard hitting reference to this. David Bradshaw of the Guardian Newspaper comments "This overt satire effectively encourages the audience to ask questions the movie is uninterested in answering. Do the aliens unite white and black earthlings in an ironic common front of caste-paranoia?" (Bradshaw.2009) Blomkamp doesn't answer this question, it can be argued his motive is simply to get the audience to ask the question. 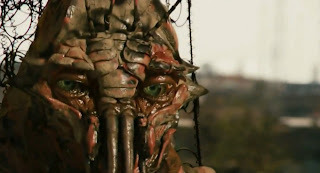 As Wikus blunders his way through District 9, he accidentally comes into contact with some form of alien slime that alters his DNA. His body mutates, enabling him to use the aliens machines and weaponry which until now, could only be operated by the aliens. Coveted by the MNU and Nigerian gangs operating within District 9, Wikus teams up with an alien called Christopher Johnson and his son CJ. Together they seek a way of returning the refugee aliens to their planet and reversing Wikus' mutation. 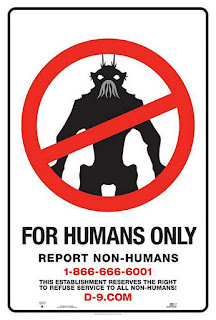 The computer generated aliens are extremely well designed and realised, interacting with the live surroundings seamlessly. With their grotesque appearance and strange eating habits (cat food), it's hard to root for, let alone emphasise for them. However Blomkamp achieves this as Roger Ebert explains, "what Neill Blomkamp somehow does is make Christopher Johnson and his son, Little CJ, sympathetic despite appearances. This is achieved by giving them, but no other aliens, human body language, and little CJ even gets big wet eyes, like E.T." (Ebert. 2009). 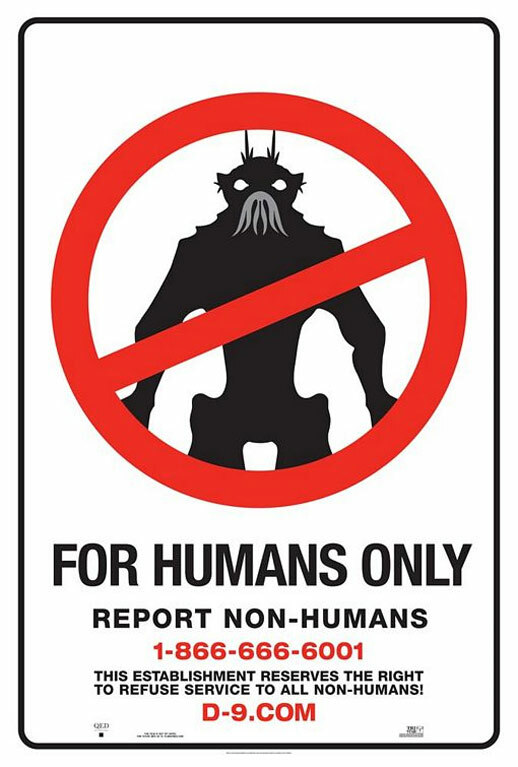 District 9 sets itself apart from traditional summer blockbusters by incorporating political messages on racism and xenophobia into an enjoyable, slick sci-fi / action film. Blomkamp interestingly made it on a low budget in conjunction with Peter Jackson after their "Halo" video game adaptation fell through. He shows remarkable talent behind camera with scenes reminiscent of David Cronenbergs many body horror flicks and Ridley Scott's Alien. As a review in the Dailytelegraph confirms "it reboots motifs from classic extra-terrestrial and urban catastrophe movies such as Silent Running and Planet of the Apes, and transposes them to the contemporary ghetto context that in recent years has given urgency and kinetic charge to the likes of Slumdog Millionaire and City of God." (Dailytelegraph. 2009) The gritty realism of the documentary style approach adds to it's believability. This combined with fantastic visual effects and an intelligent viral / marketing campaign make Blomkamp one to watch.